Demonstrating industry-standard knowledge and practical skills, Cisco Certifications are amongst the most important, influential and sought-after qualifications for professionals in internet-based industries. Fast Lane offers training courses to help professionals effectively prepare for the five levels of Cisco certification. 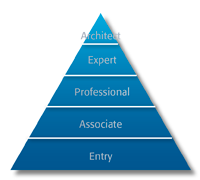 Whether you are preparing for certification in entry, associate, professional, expert or architect level; Fast Lane can provide comprehensive training and resources. The certification can be attained in ten different certification tracks, including: collaboration, data centre, design, routing and switching, security, service provider, wireless and more. Ten Certification Tracks: Certification can be attained in various fields: Routing & Switching, Design, Security, Service Provider, Data Center, Voice, Video and Wireless. Complete Packages to prepare for your certifications! Fast Lane takes you to your Cisco Partnership! With ten certification tracks across five different levels, Fast Lane can help you specialise in specific areas and attain the level of knowledge and qualification you desire or require. Achieving the certifications could open up a huge selection of professional opportunities and enhance your core knowledge and practical skills. At Fast Lane we also offer recertification courses, helping established Cisco professionals keep abreast and updated of the latest industry developments and changes. Recertification is also available to professionals whose certificates have expired or become inactive due a period without renewal. Our fully-trained and certified Cisco experts can help you achieve a higher level of Cisco Certification – enhancing knowledge and employment opportunities.